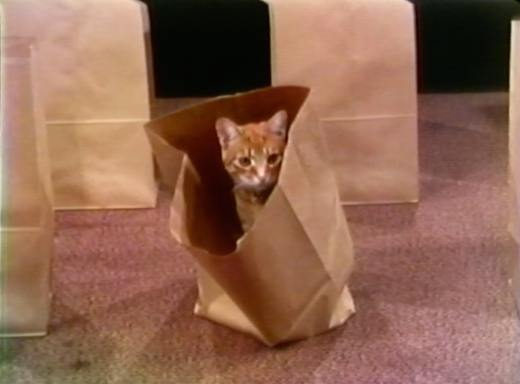 Oh Yes, Oh No (1979), is a performance collaboration between Jane Ellison and Western Front co-founder Eric Metcalfe (“The Tootaloonies”) that explores themes of consumption and desire through humorous object comparison. Fourteen brown paper bags are lined up in two rows on the stage. As Ellison and Metcalfe move down the rows and investigate the contents, one by one, it is revealed that each bag contains a consumable commodity. These include: a newspaper, reading glasses, cigarettes, a mascara tube, a tie, a bottle of Pepsi, a bottle of Coca-Cola, a bracelet, an oil can, a condom, a soiled women’s serviette, a green apple, and a red apple. 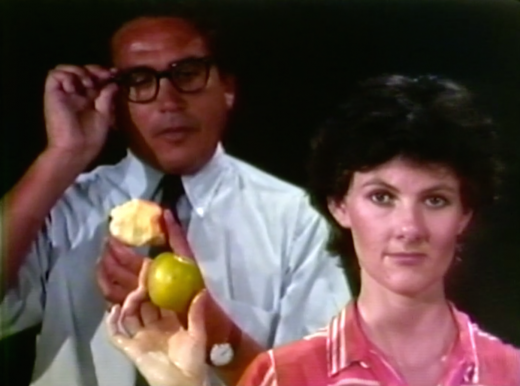 Mimicking the style of a TV commercial, Ellison and Metcalfe, with objects in hand, turn towards the camera to evaluate each object with an exaggerated “Oh yes!” or “Oh No!” The connections made between the objects gradually become more gendered and sexualized until they reach the end of the row and the final object is consumed. Oh Yes, Oh No (1979) can be found here.